Alter Ego - photoperiodical, feminized mainly Indica strain, crossed by the scientists and plant breeders of seed-bank Neuroseeds. 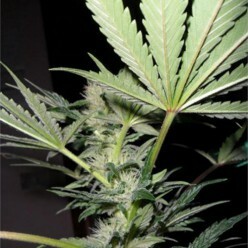 Strain Violator Kush was taken as a basis and crossed with mysterious "X"-strain. As a result, a new strain has been introduced with powerful effect similar to narcotic one, and the effect of the plant can make you doubt in reality, however, mostly it affects body. The name Alter Ego has been given to the strain in this connection. This strain can be distinguished among the similar Indica strains by its features: blooming period is only 60 days, and already in September you will harvest about 500 g from one square meter, high content of THC which is equal to 22%. We should also mention vulnerability to mould and pests and they are easy to maintain and care. Good choice for the beginners.